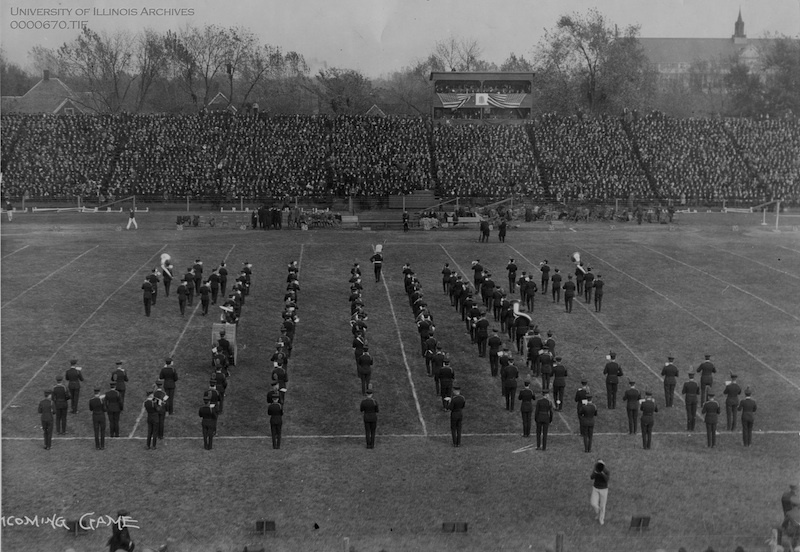 Built in 1923 and dedicated on October 18, 1924 as a memorial for the men and women who served in WWI, Memorial Stadium stands as one of fifteen college stadiums around the country that were built to honor military veterans. In February 1919, a special committee was appointed by the University War Committee to “undertake a preliminary consideration of a permanent memorial at the University of Illinois” to commemorate the University’s involvement in World War I, as well as methods of raising funds to do so. Dean David Kinley started as chair of this special committee, and was shortly replaced by Professor L.H. Provine of the architectural engineering department due to other obligations. The committee sought suggestions from students, faculty, and friends, while asking them to keep in mind that the memorial will probably be financed largely by donations. 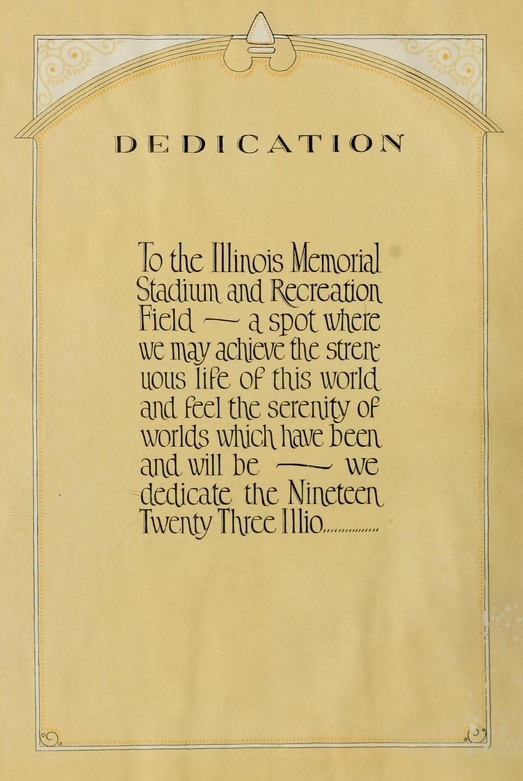 Among the suggestions offered were a French garden, a memorial arch, a museum building, a stadium, a student union building, and a memorial altar (Daily Illini 1919). On March 20th, 1919, the students held a mass meeting to express their views and vote on what type of memorial should be constructed. 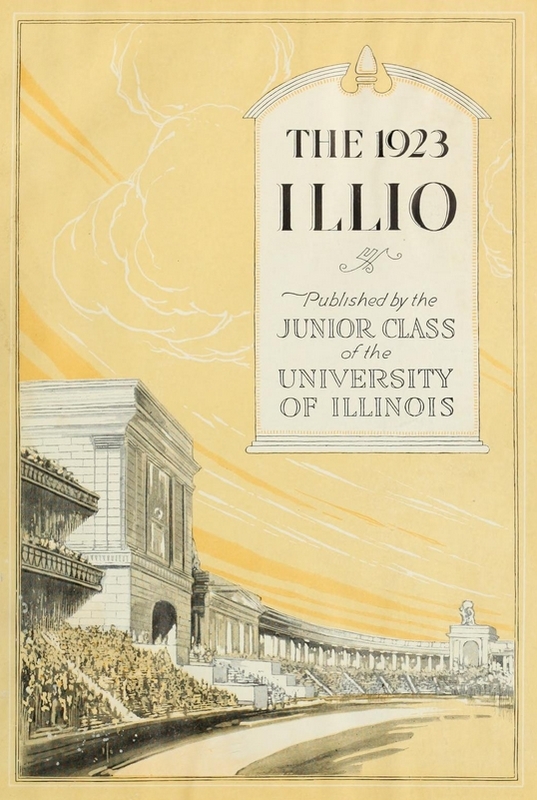 In the end, 358 students voted for a memorial that would be useful in character, such as a Union building, while 49 voted for “an idealist type of memorial” (Daily Illini 1919). While George Huff, the Director of Athletics at the time, had been campaigning for the construction of a stadium “similar to the famous Yale “Bowl” (Urbana Daily Courier April 25th 1915) as early as 1915, it wasn’t until 1920 that he started to receive funds. J.B. Frazier, class of 1914, pledged “at least $250 for stadium, payable to the Athletic association when the first corner stone has been completed. 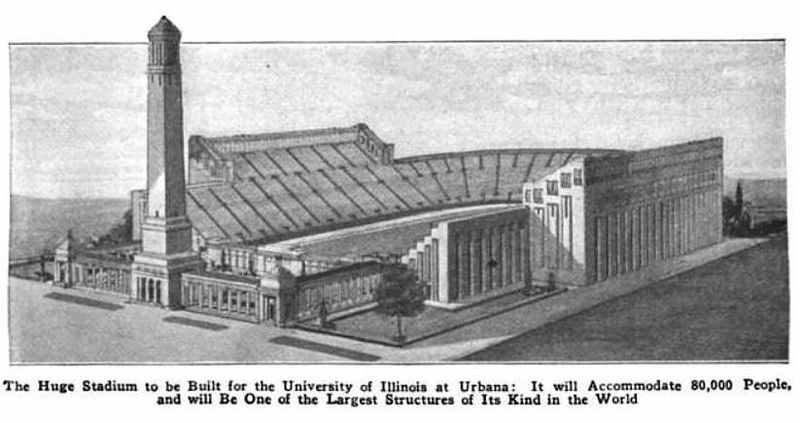 The University of Illinois must either have a stadium or discharge her athletic coaches; for as long as great teams are turned out, the public will demand seats for the games and the university must provide them” (Urbana Daily Courier, November 19th 1920). 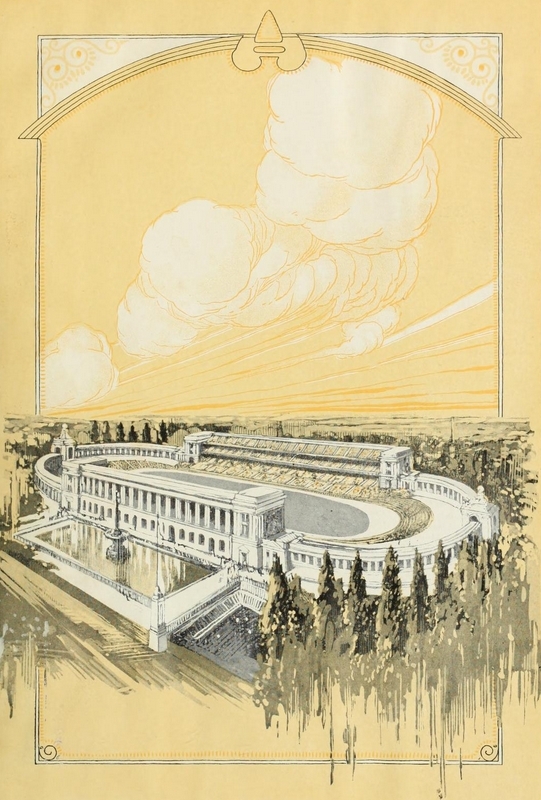 With plans for the stadium becoming more of a reality, it wasn’t until March of 1921 that a proposal sanctioned by the University of Illinois student’ Executive Committee was approved raising the stadium as a memorial to Illini soldiers (Urbana Daily Courier March 7th, 1921). 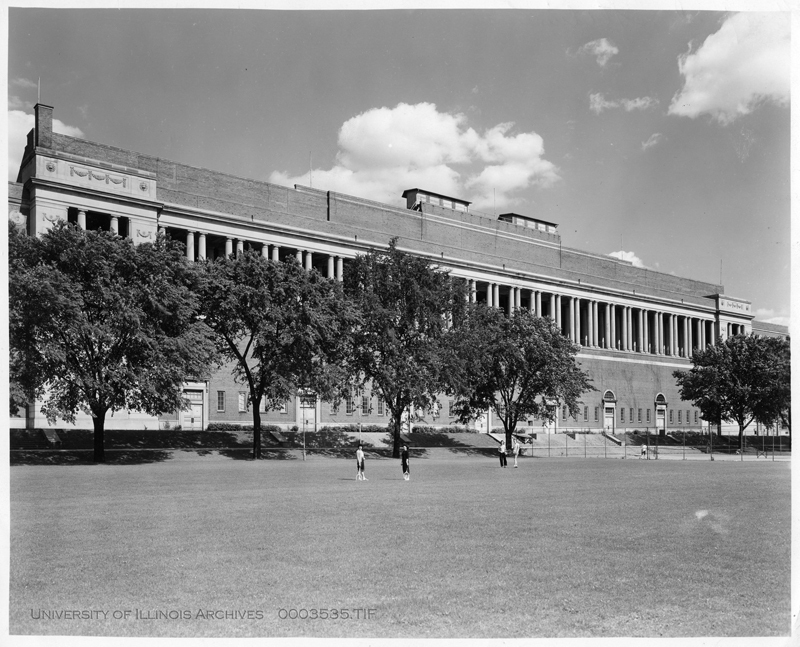 Memorial Stadium was designed by the architectural firm Holabird & Roche and constructed by the English Brothers of Champaign. 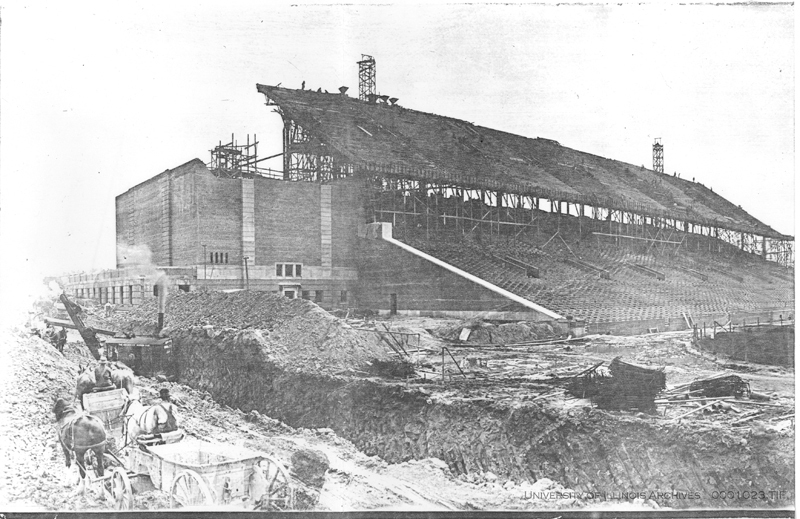 On September 11th, 1922, George Huff tossed the first spade of dirt at the construction site of what was to become the realization of his dream stadium (Kacich 2002). 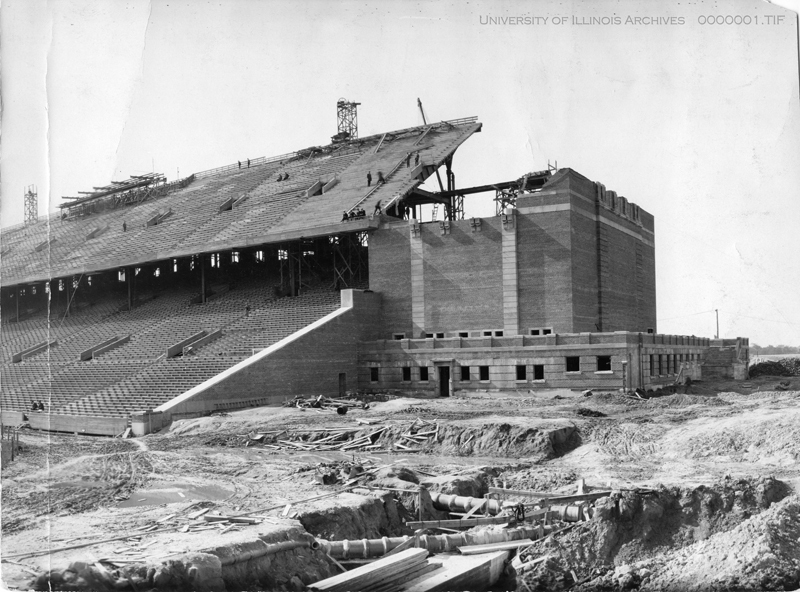 The stadium opened November 3rd, 1923 and was officially dedicated October 28th, 1924 (UI Division of Intercollegiate Athletics). According to original contracts, the stadium cost approximately $1.58 million dollars to build. 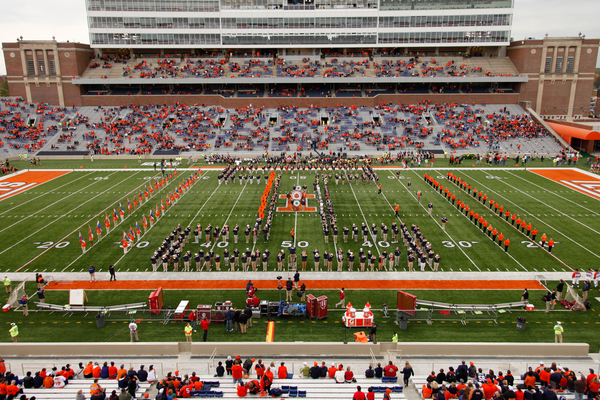 Upon completion, Memorial Stadium was comprised of 2,700 tons of structural steel, 800 tons of reinforcing steel, 4.8 millions bricks, 50,000 barrels of cement, and 436 miles of lumber (Kacich 2002). Memorial Stadium has undergone numerous renovations over the years, including a press box in 1967, aluminum seating, artificial turf, and a new lighting system in the 1970s, and the replacement of concrete bleachers in both upper decks and updates to the electrical and drainage systems in the 1990s. Perhaps the most major renovation to the stadium, called the “Renaissance” project, was initiated in 2008. This $121 million dollar project included renovations to the north end zone, refurbishing the east great hall, and the addition of luxury suites, indoor and outdoor club areas, and a refurbishment of the concourses. 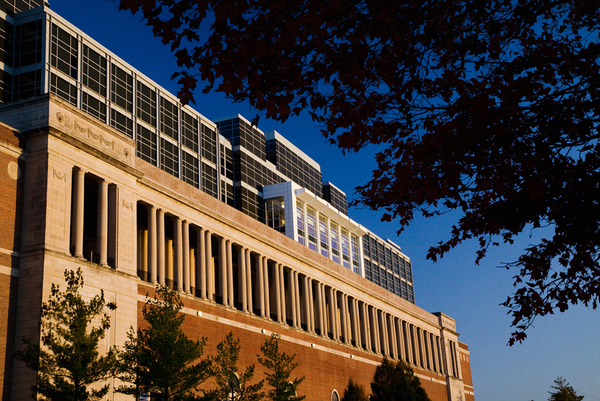 In addition, a three-level structure was completed on the west balcony which includes a new press box and an indoor club, named the “77 club” in honor of alumni Harold “Red” Grange (UI Division of Intercollegiate Athletics). Unique to the Stadium are the 200 limestone columns that line the east and west sides of the stadium. Each of these columns is inscribed with the name of one of the 189 men and women who lost their lives in WWI (Illinois Premium Seating). 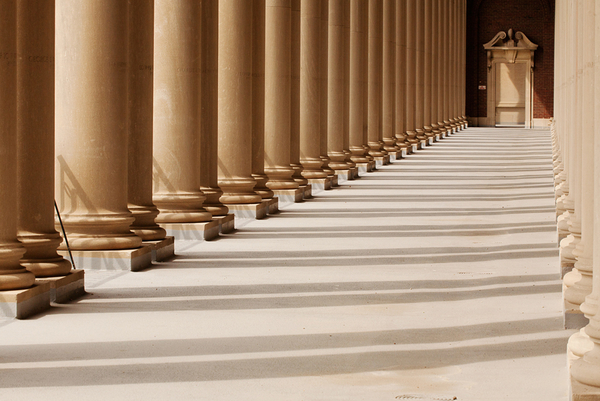 Several of the other columns memorialize other military entities such as the Student Army Training Corps, the Student Navy Training Corps, and the Unknown Soldier. 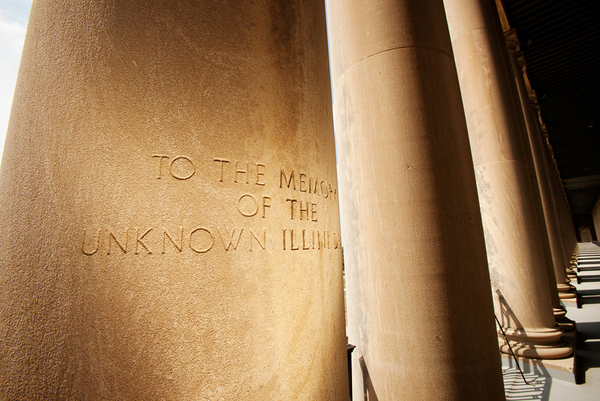 In 2002, the original dedication was extended to honor the 932 alumni, students, faculty, and staff that have lost their lives in our nation's conflicts and wars since 1918 (University of Illinois Alumni Association 2012). When the stadium was built, it was said that storms caused a bulldozer to sink into a muddy field and that it would be too expensive to excavate. While a metal detector was unable to unable to find evidence of a large metal object underground, rumors have yet to be dispelled (Illinoishomepage 2013). 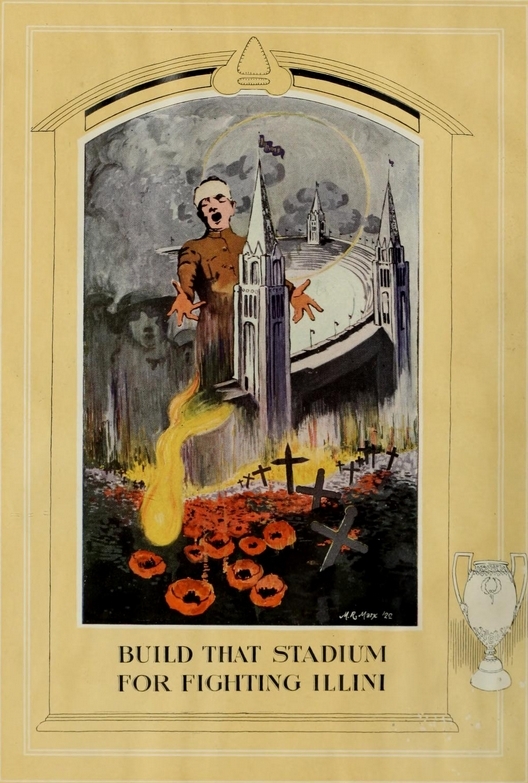 “Memorial Stadium,” ExploreCU, accessed April 21, 2019, https://explorecu.org/items/show/173.